Smooth sidewalls on Mickey’s new refrigerated van body are great for decal application and appearance. 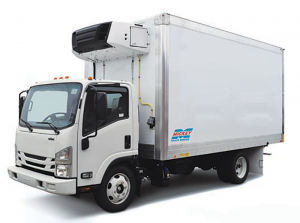 Mickey Truck Bodies has designed a new refrigerated van body (reefer) featuring thermal-efficient composite panels on the roof, walls and floor that maintain the inside temperature from 0 degrees to 32 degrees F more efficiently than conventional panels. The bodies also use smooth sidewalls (no fasteners) which provide for easier decal application and an outstanding “billboard” appearance. The unit is ideally suited for making deliveries in tight city markets. Standard features include insulated roll-up rear doors, E-Track cargo constraints and food grade interior walls. The company is currently building the unit in a 16-foot length, but longer versions are on the drawing board, according to Tom Arland, Vice President of Beverage, Van and Specialty Vehicle Sales at Mickey. Every new reefer unit Mickey manufactures is thoroughly evaluated for thermal efficiency to ensure that the cargo is maintained at precisely the required temperature. Click HERE for full details of the features and options available on the new Mickey Truck Bodies reefer van body.